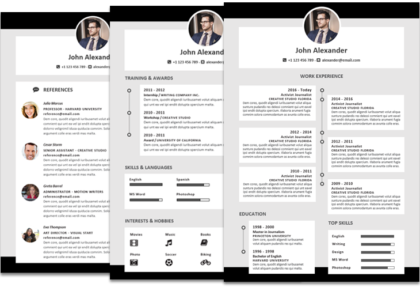 The John Alexander resume template – full width colored offers the same design and layout of the John Alexander full width resume template, with the addition of more colors. 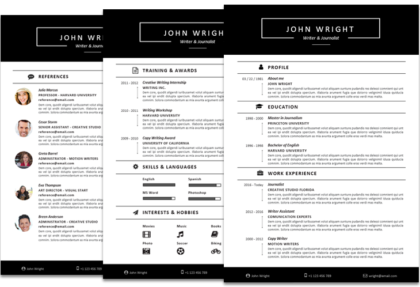 The black and white version of this resume model is included in all packages, so it won’t be missed. In addition, here come included more color versions (Blue, Red, Green, Yellow, Pink, Purple and Fuchsia). And the color offering is not over yet. In fact, if you like you can create your own color from the Word templates that you will download. 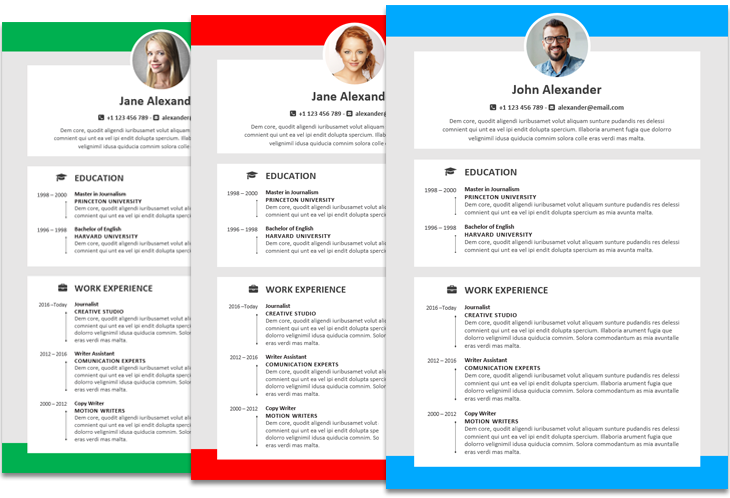 By using a colorful resume template for Word, rather than the classic black and white resume, you can highlight your creativity while keeping a professional appearance. This is very important. 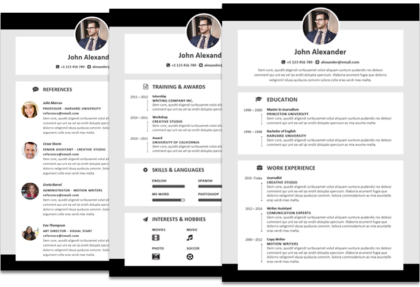 You might be looking for a creative resume template and with this one, yet not too extravagant and very functional, you could express your creativity or apply for a creative job. You can select two different downloads. 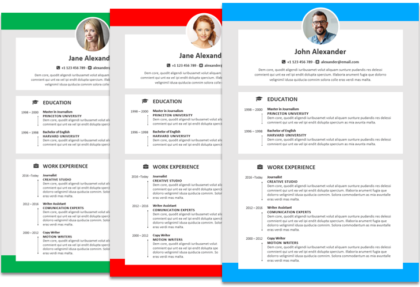 Package 1 comes with the first resume page only, offering space for a candidate picture (it can be removed if needed), a “Bio” section for prominent statements, as well as ”Education” and “Work Experience” sections. Contact information has a prominent position and invites to give the candidate a call back. The overall design starts and finishes with colored stripes. 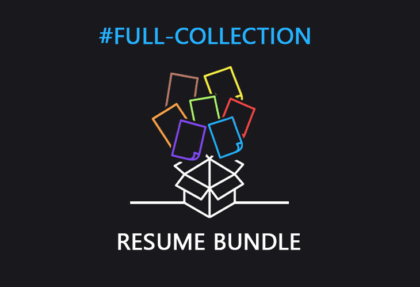 Package 2 includes the second resume page (“Training & Awards”, “Skills & Languages”, “Interests & Hobbies”), and also a Reference Page and Cover Letter, all matching in style. These sections were designed with flexibility in mind, in fact they can be edited to reflect different information where you would like to make use of the dates, measuring bars or icons systems. All packages come with 675 icons included, for your convenience and use. If you are here to download resume templates for MS Word that grab attention, this could be a great one to consider, being visually appealing and yet very functional. 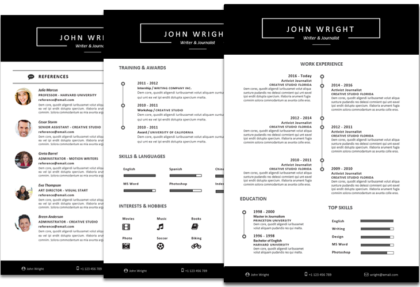 Time goes and so far a great creative and modern resume template is this, I think I will buy it. Wow this looks a real functional resume template. It’s for Word so I will edit easily. I was looking where to download creative resume templates for Word, and this is my last stop! 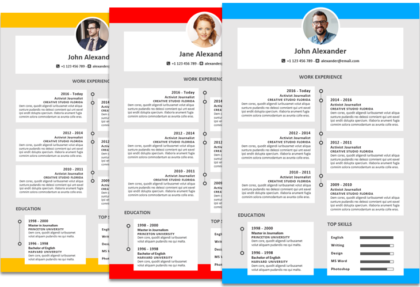 Such a colorful resume template, I like the idea to change colors and see which I like. 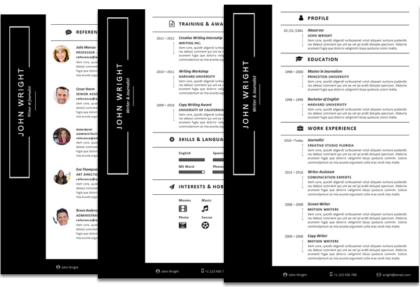 I may save a lot of time with this creative cv template for Word, now that I have it. This is one of the best resume templates I have seen for Microsoft Word. Word resume, lots of colors, that’s the way I like it. A curriculum template with many colors and cover letter, wonderful options. So many colors to choose from, this is a creative resume template I needed. Now yes this is surely a creative resume template, colored, so many colors included! at the Price of 2 Resumes!